So, I’ve been thinking about a logo. Crosniacs has a logo featuring the Lion of Flanders. 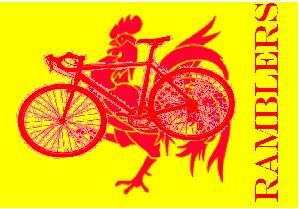 Here I’ve borrowed the Wallone, uh, rooster? Er, Charlemagne! It was cold yesterday, but colder today. I felt like crap on the bike yesterday and am sick today. It’s nice to know that it wasn’t merely in my head. The mental game of fighting cold, wind, loneliness is hard enough, but when your legs won’t go, it’s the pits. Any Ramblers out there riding?